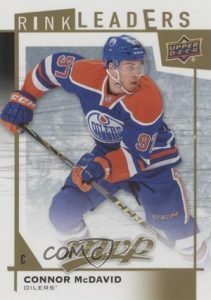 2016-17 Upper Deck MVP Hockey kicks off the new season of NHL card collecting with a low-end release that still packs a lot into it. Collectors can find a mix of parallels and inserts in every box. Built around the deep 360-card main set, 200 base cards are joined by 100 Short Prints that average one per pack. In addition, there are several parallels to chase. Silver Script (1:3 packs) parallels fall on the more common side while Super Script parallels are limited to 25 copies. The final 60 cards in the main set include 30 NHL Territories that work with a horizontal design and feature a skyline shot of the team's home city while 30 Leading Lights cards celebrate key players. Both subsets combine to fall 1:8 packs and they are also found as rare Autograph and Jersey parallels. While they don't surface as often, autographs include 2016 NHL #1 Draft Pick Signatures (1:12,500 packs) and ProSign Autographs (1:465 packs). 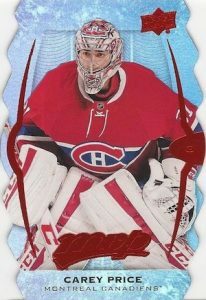 Among the many inserts in 2016-17 Upper Deck MVP Hockey are choices such as Colors & Contours that average five per box. Showcasing Spectrum Light F/X technology, the full checklist includes nine subsets with three different colors — Gold, Purple, and Teal — along with several die-cut designs and varying rarity in the form of Level 1, Level 2 and Level 3. Puzzle Backs combine to form a larger image and average 1:2 packs. 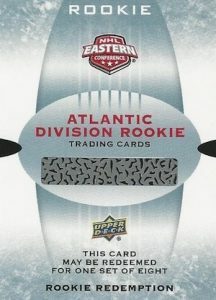 Finally, Rookie Redemptions (1:400 packs) are a case hit that yields an eight-card set for some of the season's key rookies, redeemable at a later date and grouped by division. 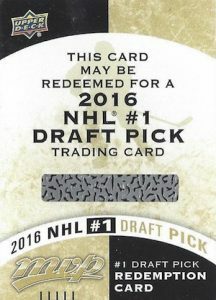 There is also a more limited 2016 NHL #1 Draft Pick SP Redemption (1:1,250 packs) reserved for the top pick. 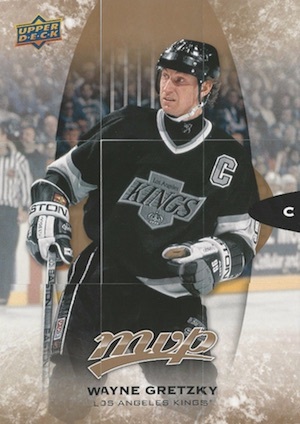 Upper Deck has revealed that 2016-17 Upper Deck MVP will be included in the UD e-Pack program, which is now available. 360 cards. Shop for base sets on eBay. Overall Odds: High Series SP - 1:1 h/e, 1:2 r; NHL Territory SP - 1:10 h/e, 1:20 r; Leading Lights SP - 1:20 h/e, 1:40 r.
PARALLEL CARDS (Only #1-300): Green Script*: ePack only; Silver Script - 1:2.5 h/e, 1:5 r; Gold Script: Base - #/165, High Series - #/135; Super Script #/25 (h/e), Printing Plates 4/4. Overall Odds: 1:1,250 Hobby/ePack, 1:12,500 Retail. Each card is good for a full division set. 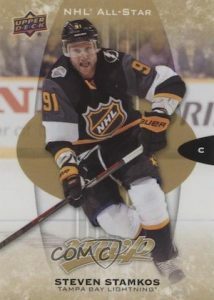 Overall Odds: 1:400 Hobby/ePack, 1:4,000 Retail. Teal Odds: Level 1 Teal - 1:13 h/e, Level 2 Teal - 1:33 h/e, Level 3 Teal - 1:100 h/e. Gold Odds: Level 1 Gold - 1:22 h/e, Level 2 Gold - 1:33 h/e, Level 3 Gold - 1:44 h/e. Purple Odds: Level 1 Purple - 1:44 h/e, Level 2 Purple - 1:100 h/e, Level 3 Purple - 1:200 h/e. 200 cards. Specific puzzle piece noted below. Overall Odds: 1:2 packs Hobby, 1:4 packs Retail. Overall Odds: 1:1,600 Hobby/ePack. Specific group odds noted below. Overall Odds: 1:1,400 Hobby/ePacks. Specific group odds noted below. 2 cards. Awarded for completing set on ePack. Overall Odds: 1:600 Hobby/ePacks. Specific group odds noted below. Overall Odds: 1:144 Hobby/ePacks, 1:1,440 Retail. Specific group odds noted below. 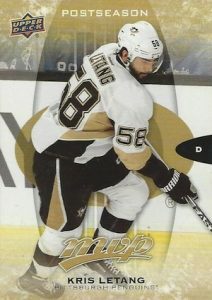 Overall Odds: 1:370 Hobby/ePack, 1:2,325 Retail. Specific group odds noted below. Glad to see the went back to a larger set. Any details on the puzzle back cards? Are these just same obverse as the base set but the groups of nine cards make a large overall picture on the reverse (eg, if put in 9 sleeve pages, back makes one big image)? Aden Taylor � I contacted Upper Deck and this is the correct hobby format: 8 cards per pack / 20 packs per box / 20 boxes per case. For collectors on a low budget like me this product is great. The only bad thing is the number of packs reduced to 20 but still a fun product to bust !! Are the blaster boxes considered retail? I got a blaster box today and it was so great! I ended up getting the Auston Matthews redemption card at 1:12,500 odds (retail) and I got a cool gold script card! I want to get more of these boxes! Of Course they short print Eichel and McDavid, milk all they can out of those 2 players. 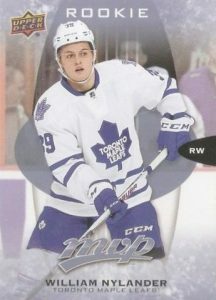 when will upperdeck release info on the rookie redemption cards who are the 8 rookies for each card? Milk all they can out of the 2 studs is exactly right. I actually used to feel really bad for UD, and the way Panini and their ability to get “EXCLUSIVE” rights to even colleges-makes it IMPOSSIBLE for anyone to compete unless they’re practically naked with no affiliation to their teams. Great customer service, but that’s about it. Whoever is rescponsible (NFLPA, NHLPA, NBA Players Association) is killing the hobby right in front of our eyesl Now it’s UD and the few cases of Leaf they produce each year. I do love Leaf, and give them and the former ITG all my $$ Beautiful, on card signatures and very nice cards on top of it. Not mass produced and extremely nice to look at. Hopefully the rest of the hobby follows my lead and punishes UD AND Panini for ruining this once great and fun hobby.